Matthew 16 records that the Savior promised to give Peter the keys of the kingdom of heaven (see Matthew 16:18–19). Six days later the Lord took Peter, James, and John onto a mountain, where He was transfigured before them in the presence of Moses and Elias, who was Elijah (see Matthew 17:1–13). Latter-day prophets have taught that Peter, James, and John received the promised priesthood keys on this occasion. Then, as recorded in Matthew 18, the Savior taught His disciples doctrines and principles that would help them use these keys when they would lead the Church after His departure. As recorded in Matthew 16, Peter bore his testimony that Jesus is the Christ, and the Savior explained that Peter had received that knowledge by revelation. The Savior rebuked the Pharisees and Sadducees for insisting that He show them a sign from heaven. He declared that they were able to forecast the weather based on the appearance of an evening sky, yet they were unable to discern the “signs of the times” (Matthew 16:3), by which the Savior meant the evidence that He was the promised Messiah. Elder Neal A. Maxwell (1926–2004) of the Quorum of the Twelve Apostles explained why it is that “a wicked and adulterous generation seeketh after a sign” (Matthew 16:4): “Why does this generation seek a sign? queried Jesus with a deep sigh. (See Mark 8:12.) The more wicked and adulterous the people of a particular period, the more they demand signs as a condition of belief. Sensual individuals crave and live by sensations. Disciples, instead, walk and ‘overcome by faith’ (D&C 76:53), accepting gratefully the evidence of things not seen which are true (see Heb. 11:1; Alma 32:21)” (“Answer Me,” Ensign, Nov. 1988, 31–32). See also the commentary for Matthew 12:39–40. How was the witness sought by the Pharisees and Sadducees different from the witness Peter received? What personal revelation have you received that Jesus is the Christ? Elder Bruce R. McConkie (1915–85) of the Quorum of the Twelve Apostles defined the sign of the prophet Jonas: “Jonah’s burial in and coming forth from the ‘great fish’ (Jonah 1:15–17; 2) symbolizes the death, burial, and resurrection of Christ” ( Doctrinal New Testament Commentary, 3 vols. [1965–73], 1:278). The Savior taught His disciples to beware of “the leaven” of the Pharisees and Sadducees, which was their doctrine. Elder Bruce R. McConkie explained that this teaching of the Savior can be likened to the need to beware of false doctrines and philosophies in all ages: “Literally, leaven is a substance that produces fermentation, as for instance yeast which causes bread to rise. Figuratively, leaven is any element which, by its fermenting, spreading influence, affects groups of people so that they believe and act in particular ways. Thus to beware of the leaven of the Pharisees and Sadducees is to shun their false doctrines, their concept that the Messiah must prove his claim to divinity by signs, for instance. Similarly, today, the warning is to beware of the leaven of any group whose false doctrines and antichrist philosophies work to keep men from accepting the truths of the restored gospel” ( Doctrinal New Testament Commentary, 1:379). “The modern-day scene in Caesarea Philippi is unique. There is a mountain at the base of which is a mighty rock from which water seems to be flowing. These cascades comprise one of the three major headwaters of the River Jordan, literally the liquid lifeline of this country. As Jesus was preparing to conclude His mortal ministry [His Crucifixion took place six months later], here He trained future leaders of His Church. Could it be that the Savior brought His disciples to this spot to teach the lesson that this majestic mountain symbolized the rock of Christ from whom revelation would flow?﻿—revelation to bring light and life to them, just as that flowing water of the River Jordan nourishes Israel” (“Why This Holy Land?” Ensign, Dec. 1989, 15–16). Just as Moses struck the rock with his staff and water flowed from it, saving the people of Israel from death in the wilderness, the Savior is the rock from which the saving doctrines and ordinances flow, empowering us to lay hold on eternal life (see Numbers 20:11; 1 Nephi 17:29; 2 Nephi 25:20). As you reflect on modern attitudes toward Jesus Christ and your own testimony of Him, how would you answer the Savior’s two questions in these verses? What do you think is important about this conversation between Jesus Christ and His Apostles? “We cannot depend on the testimonies of other people. We need to know for ourselves. President Gordon B. Hinckley said, ‘Every Latter-day Saint has the responsibility to know for himself or herself with a certainty beyond doubt that Jesus is the resurrected, living Son of the living God’ (‘Fear Not to Do Good,’ Ensign, May 1983, 80). “We receive this testimony when the Holy Spirit speaks to the spirit within us. We will receive a calm and unwavering certainty that will be the source of our testimony and conviction irrespective of our culture, race, language, or socioeconomic background. These promptings of the Spirit, rather than human logic alone, will be the true foundation upon which our testimony will be built. “The core of this testimony will always be the faith in and the knowledge of Jesus Christ and His divine mission” (“The Power of a Personal Testimony,” Ensign or Liahona, Nov. 2006, 38). As the Savior taught Peter about revelation, He used a wordplay on Peter’s name, declaring to Simon, “Thou art Peter [Petros], and upon this rock [petra] I will build my church” (Matthew 16:18). The Greek word petros means an isolated small rock or stone. The Greek word petra can also mean “a stone,” but in addition it can refer to stony soil, bedrock, or a large mass of rock. From these words we learn that it was not upon Peter as a man that the Church would be built, but upon the bedrock of revelation. To read about the significance of Peter’s name being changed from Cephas, see the commentary for John 1:42. President Howard W. Hunter (1907–95) taught: “‘And upon this rock I will build my church.’ Upon what rock? Peter? Upon a man? No, not upon a man, upon the rock of revelation, the thing which they were talking about. He had just said, ‘… flesh and blood hath not revealed it unto thee, but my Father which is in heaven.’ This revelation that Jesus is the Christ is the foundation upon which he would build his Church” (in Conference Report, Oct. 1965, 112; see also Teachings of Presidents of the Church: Joseph Smith , 195). In the scriptures the phrase “the gates of hell” can refer to the powers of death or the powers of evil. Thus, the Savior’s promise that “the gates of hell shall not prevail” means that death and evil will not permanently overpower the Church. The Restoration of the Church in the latter days is one way this promise has been fulfilled. One reason the gates of hell will not prevail is because the keys spoken of in Matthew 16:18–19 are instrumental in “the salvation of the children of men, both as well for the dead as for the living” (D&C 128:11). President Harold B. Lee (1899–1973) explained that providing temple ordinances for our deceased loved ones is another way of preventing the gates of hell from prevailing against the Lord’s Church: “Now, the gates of hell would have prevailed against the Lord’s work if there hadn’t been given the ordinances pertaining to the salvation of those who are dead. During those periods when the priesthood to perform the saving ordinances of the gospel was not upon the earth, there were millions who lived, many of whom were faithful souls. If there hadn’t been a way by which the saving ordinances of the gospel could be performed for those who thus died without the knowledge of the gospel, the gates of hell would have prevailed against our Father’s plan of salvation” ( Teachings of Presidents of the Church: Harold B. Lee , 104). In the first century A.D., keys were typically made of iron and were bulkier, more expensive, and less common than modern house keys. To hold the keys of a house was a position of great trust. Thus, keys were a fitting symbol of special authority, responsibility, and purpose. Ancient scriptures make repeated use of the symbol of keys, which represents the power to lock and unlock, open and shut, and permit or prevent entrance (see Isaiah 22:22; Matthew 16:19; 18:18; Revelation 1:18; 3:7; 9:1; 20:1). Six days after Jesus told Peter, “I will give unto thee the keys of the kingdom of heaven” (Matthew 16:19; 17:1), Peter, together with James and John, received the promised keys on the Mount of Transfiguration (see Matthew 17:1–9; in History of the Church, 3:387). President Joseph F. Smith (1876–1972) defined the keys of the priesthood: “The Priesthood in general is the authority given to man to act for God. Every man ordained to any degree of the Priesthood has this authority delegated to him. But it is necessary that every act performed under this authority shall be done at the proper time and place, in the proper way, and after the proper order. The power of directing these labors constitutes the keys of the Priesthood” ( Teachings of Presidents of the Church: Joseph F. Smith , 141). Elder Bruce R. McConkie wrote that priesthood keys “are the right of presidency, the directing, controlling, governing power” ( Mormon Doctrine, 2nd ed. , 411). 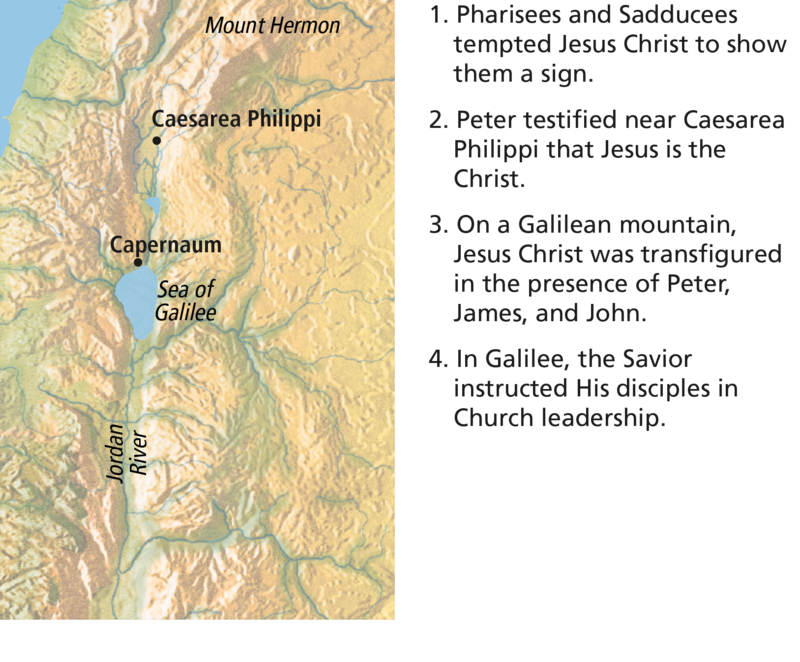 Peter exercised these priesthood keys when he presided over the selection of a new Apostle (see Acts 1:15–26), oversaw the spreading of the gospel to Samaria (see Acts 8:14–25), received a revelation regarding Gentile converts (see Acts 10:9–48), and presided over the Jerusalem conference (see Acts 15:6–29). The President of The Church of Jesus Christ of Latter-day Saints holds all the keys of the kingdom. The President and his counselors﻿—the First Presidency﻿—have the right to preside over the Church (see D&C 81:2; 107:22). Peter and the other Apostles received priesthood keys that made their actions and decisions binding both on earth and in eternity. President Russell M. Nelson explained that the keys promised to Peter in Matthew 16:19 included the sealing authority exercised in our temples today, authority that makes it possible for families to be bound together for eternity: “We should understand the sealing authority of the priesthood. Jesus referred to this authority long ago when He taught His Apostles, ‘Whatsoever thou shalt bind on earth shall be bound in heaven’ [Matthew 16:19]. That same authority has been restored in these latter days. Just as priesthood is eternal﻿—without beginning or end﻿—so is the effect of priesthood ordinances that bind families together forever” (“Personal Preparation for Temple Blessings,” Ensign, May 2001, 33). “In 1976 following a conference in Copenhagen, Denmark, President Spencer W. Kimball invited us to a small church to see the statues of Christ and the Twelve Apostles by Bertel Thorvaldsen. The ‘Christus’ stands in an alcove beyond the altar. Standing in order along the sides of the chapel are the statues of the Twelve, with Paul replacing Judas Iscariot. “President Kimball told the elderly caretaker that at the very time Thorvaldsen was creating those beautiful statues in Denmark, a restoration of the gospel of Jesus Christ was taking place in America with Apostles and prophets receiving authority from those who held it anciently. “There came to me that witness known to Latter-day Saints but difficult to describe to one who has not experienced it … and I knew that, in very fact, here stood the living prophet who held the keys” (“The Shield of Faith,” Ensign, May 1995, 8). For information about why Jesus told His disciples to “tell no man that he was Jesus the Christ” (Matthew 16:20), see the commentary for Mark 8:30. For insights about this conversation between Peter and the Savior, see the commentary for Mark 8:33. To read about the Savior’s teachings on taking up our crosses and losing ourselves for His sake, see the commentary for Mark 8:34–38. Caesarea Philippi with Mount Hermon in the background. Mount Hermon is one of the plausible locations of the Transfiguration. Matthew 17:1–13 records the Transfiguration﻿—the glorious experience when the Savior was transfigured in the presence of Peter, James, and John. This event occurred six days after Peter’s confession that Jesus is the Christ (see Matthew 16:16) on an unnamed mountain that is sometimes referred to as the Mount of Transfiguration. Throughout the scriptures, mountains are used as places of divine instruction and revelation to mortals (see Exodus 3:1; 1 Kings 19:8; 1 Nephi 17:7; Ether 3:1; Joseph Smith—History 1:51–54). The Gospel of Matthew records a number of times when the Savior used mountains as places of spiritual retreat and instruction (see Matthew 5:1; 14:23; 15:29–39; 21:1; 24:3; 28:16–20). On numerous occasions, the Savior separated Peter, James, and John from the other Apostles. Only these three Apostles witnessed the raising of Jairus’s daughter from the dead (see Mark 5:22–24, 35–43). Only they were present on the Mount of Transfiguration, where they received priesthood keys. Only they were taken to a certain location within Gethsemane, where they beheld the Savior’s agony as He took upon Himself the sins of the world. These experiences and perhaps many more helped to prepare Peter, James, and John for the time following the death of Jesus Christ, when they served as the First Presidency of the Church (see Joseph Fielding Smith, Doctrines of Salvation, ed. Bruce R. McConkie, 3 vols. [1954–56], 3:152). The Guide to the Scriptures defines transfiguration as “the condition of persons who are temporarily changed in appearance and nature﻿—that is, lifted to a higher spiritual level﻿—so that they can endure the presence and glory of heavenly beings” (“Transfiguration”; scriptures.lds.org). “Elijah: Elias is the New Testament (Greek) form of Elijah (Hebrew), as in Matt. 17:3–4, Luke 4:25–26, and James 5:17. In these instances, Elias was the ancient prophet Elijah whose ministry is recorded in 1 and 2 Kings. “Forerunner: Elias is also a title for one who is a forerunner. For example, John the Baptist was an Elias because he was sent to prepare the way for Jesus (Matt. 17:12–13). “Restorer: The title Elias has also been applied to others who had specific missions to fulfill, such as John the Revelator (D&C 77:14) and Gabriel (Luke 1:11–20; D&C 27:6–7; 110:12). “A man in Abraham’s dispensation: A prophet called Esaias or Elias who apparently lived in the days of Abraham (D&C 84:11–13; 110:12)” (Guide to the Scriptures, “Elias”; scriptures.lds.org). The title Elias can also be applied to Jesus Christ Himself (see Joseph Smith Translation, John 1:28 [in the Bible appendix]). The Joseph Smith Translation clarifies that Peter, James, and John understood that John the Baptist was an Elias sent to prepare the way for the Savior’s first coming. It also teaches that another Elias would “come and restore all things, as it is written by the prophets” (Joseph Smith Translation, Matthew 17:10–14 [in the Bible appendix]). In this respect, the Prophet Joseph Smith was an Elias who would come to restore all things. The accompanying chart illustrates that the persons present on the Mount of Transfiguration played a prominent role in the latter-day Restoration of the gospel. This helps us to see that the same priesthood authority and keys held in previous dispensations were restored in this final dispensation. Spoke from the cloud, saying, “This is my beloved Son … ; hear ye him” (Matthew 17:5). Spoke in the Sacred Grove, saying, “This is My Beloved Son. Hear Him!” (Joseph Smith—History 1:17). Was transfigured on the mount (see Matthew 17:2–8). Appeared with God the Father in the Sacred Grove and in the Kirtland Temple (see Joseph Smith—History 1:17; D&C 110). Were transfigured and received priesthood keys from angelic ministers (see Matthew 17:1, 3–8). As angelic ministers, conferred the Melchizedek Priesthood and all its keys on Joseph Smith and Oliver Cowdery (see Joseph Smith—History 1:72; D&C 27:12–13). Appeared as a spirit on the mount (see Joseph Smith Translation, Mark 9:3 [in Mark 9:4, footnote a]). As a resurrected personage, conferred the Aaronic Priesthood on Joseph Smith and Oliver Cowdery (see Joseph Smith—History 1:68–71; D&C 13). Appeared as a translated being on the mount and conferred the keys of the gathering of Israel on Peter, James, and John (see Matthew 17:3). As a resurrected personage, conferred the keys of the gathering of Israel on Joseph Smith and Oliver Cowdery in the Kirtland Temple (see D&C 110:11). Appeared as a translated being on the mount and conferred the keys of the sealing power on Peter, James, and John (see Matthew 17:3). As a resurrected personage, conferred the keys of the sealing power on Joseph Smith and Oliver Cowdery in the Kirtland Temple (see D&C 110:13–16). Chart adapted from D. Kelly Ogden and Andrew C. Skinner, Verse by Verse: The Four Gospels (2006), 343. The Prophet Joseph Smith (1805–44) taught, “The Savior, Moses, and Elias [Elijah], gave the keys to Peter, James, and John, on the mount, when they were transfigured before him” ( Teachings: Joseph Smith, 105). Also on the Mount of Transfiguration, Moses conferred the keys of the gathering of Israel on Peter, James, and John, who, as the First Presidency, would soon be sending out missionaries to gather the righteous into the gospel. Elijah conferred the sealing power of the priesthood, which made it possible for ordinances performed on earth to be bound or loosed in heaven. Joseph Smith summarized the importance of Elijah’s mission as follows: “The spirit, power, and calling of Elijah is, that ye have power to hold the key of the revelation, ordinances, oracles, powers and endowments of the fullness of the Melchizedek Priesthood and of the kingdom of God on the earth; and to receive, obtain, and perform all the ordinances belonging to the kingdom of God” ( Teachings: Joseph Smith, 311). “… These keys [for the salvation of the living and the dead] were given to Peter, James, and John on the mount when they received this power from Elias [Elijah] and Moses, the latter conferring the keys of the gathering of Israel. Christ told these three men, who I believe received their endowments on the mount, that they were not to mention this vision and what had taken place until after he was resurrected” ( Doctrines of Salvation, 2:164–65). “(3) Moses and Elijah﻿—two ancient prophets who were translated and taken to heaven without tasting death, so they could return with tangible bodies on this very occasion, an occasion preceding the day of resurrection﻿—appeared on the mountain; and they and Jesus gave the keys of the kingdom to Peter, James, and John [ Teachings: Joseph Smith, 105]. “(9) It should also have been apparent to them that the old dispensations of the past had faded away, that the law (of which Moses was the symbol) and the prophets (of whom Elijah was the typifying representative) were subject to Him whom they were now commanded to hear. “(10) Apparently God the Father, overshadowed and hidden by a cloud, was present on the mountain” ( Doctrinal New Testament Commentary, 1:399–401). To understand more about the Savior’s teaching in Matthew 17:14–21, see the commentary for Mark 9:18, 28–29. Matthew 17:20 is the only place where the scriptures record the Savior’s teaching that it is possible to move mountains if we have “faith as a grain of mustard seed” (Matthew 17:20). While the scriptures record that the brother of Jared moved a literal mountain by his faith (see Ether 12:30), Bishop Richard C. Edgley of the Presiding Bishopric spoke about other kinds of “mountains” that can miraculously be moved by the exercise of faith: “I have never witnessed the removal of an actual mountain. But because of faith, I have seen a mountain of doubt and despair removed and replaced with hope and optimism. Because of faith, I have personally witnessed a mountain of sin replaced with repentance and forgiveness. And because of faith, I have personally witnessed a mountain of pain replaced with peace, hope, and gratitude” (“Faith—the Choice Is Yours,” Ensign or Liahona, Nov. 2010, 33). The tribute money, or tax, referred to in Matthew 17:24–27 was the temple tax required of all Israelite males over the age of 20 (see Exodus 30:11–14). This money was used to support the daily costs associated with the temple, such as the cost of incense, robes worn by the priests, and oil for the lamps. Jesus taught Peter that since the temple was His Father’s house (see Matthew 17:25–26; John 2:16), He was exempt from the payment of this tax. However, aware that others would follow His example and not wanting to give any cause for offense, Jesus, with His divine foreknowledge, instructed Peter how to make provision for payment. Elder Neal A. Maxwell used this experience of the Savior miraculously paying taxes as an example of the Savior’s knowledge of all things: “[The Savior] told His disciples to go and catch a fish and they would find the requisite coin in there. … They did and the coin was just the right denomination to pay the tribute. We can’t comprehend the staggering omniscience, but it is there and it operates to bless each of our lives” (“We Can’t Comprehend the Capacity of God,” Church News, Feb. 22, 2003, 3). As recorded in Matthew 18:1–22, the Savior taught His disciples important principles that would help them guide the Church following His death and Resurrection. These principles include the following: Effective leaders are personally converted (see verse 3); are humble (see verses 2–4); repent of their wrongdoing (see verses 7–9); are mindful of children (see verse 10); seek out those who are lost (see verses 11–14); handle the trespasses of others sensitively and discreetly (see verses 15–17); are unified and seek the Lord’s assistance in their work (see verses 19–20); and forgive others (see verses 21–22). Responding to a question about who would be greatest in the kingdom of heaven, Jesus Christ emphasized that greatness in the kingdom of heaven is achieved by being converted and humbling oneself as a little child. Scriptures record that other desirable qualities of little children include being submissive, meek, patient, full of love, alive in Christ, and without sin (see Mosiah 3:19; Moroni 8:12; D&C 74:7). President Henry B. Eyring of the First Presidency taught: “To be like a child is not to be childish. It is to be like the Savior, who prayed to His Father for strength to be able to do His will and then did it. Our natures must be changed to become as a child” (“As a Child,” Ensign or Liahona, May 2006, 15). “… Let us remember that doing the things that have been ordained by God to be important and needful and necessary, even though the world may view them as unimportant and insignificant, will eventually lead us to true greatness” (“True Greatness,” Ensign, May 1982, 19–20). “… It is better to die and be denied the blessings of continued mortal existence than to live and lead souls from the truth, thereby gaining eternal damnation for oneself” ( Doctrinal New Testament Commentary, 1:420). In this verse, how did Jesus Christ summarize the purpose of His mortal ministry? How do you see the Savior continuing to carry out that ministry today? How can you, as one of His disciples, participate in the continuing ministry of the Savior? To read about seeking after the sheep that are lost, see the commentaries for Luke 15:3–7 and for Luke 15:11–32. The Savior’s teachings in Matthew 18:15–20 refer to the law of witnesses. The foundation of this law, which required that two or three witnesses establish or decide certain matters, was set forth in Deuteronomy 19:15. The Savior’s teachings also establish a pattern of keys of authority being given first to Peter, James, and John on the Mount of Transfiguration (see Matthew 17:1–13; 18:18) and then later to all the Apostles. This pattern was followed in our day when the keys of the kingdom were given first to Joseph Smith and then later to the Twelve Apostles (see D&C 13; 27:5–14; 128:18–21; 132:46–47). Elder Bruce R. McConkie explained the meaning of Peter’s question about forgiving others and the Savior’s response: “Rabbinism called upon the offender to initiate a course of reconciliation with his brother and specified that forgiveness should not be extended more than three times to any offender. His soul as yet not afire with the Holy Spirit, Peter asked a question that, as he must have then supposed, assumed a far more liberal rule than that imposed by the Rabbis. ‘Lord, how oft shall my brother sin against me, and I forgive him? till seven times?’ Jesus answered: ‘I say not unto thee, Until seven times: but, Until seventy times seven,’ meaning there is no limit to the number of times men should forgive their brethren” ( The Mortal Messiah: From Bethlehem to Calvary, 4 vols. [1979–81], 3:91). Following Peter’s question about how often he should forgive others, the Savior taught His disciples further about the need to forgive by giving the parable of the unmerciful servant. In this parable, the king represents the Lord; the first servant represents each of us, who stand in debt to the Lord; and the second servant represents anyone who may have offended us. The parable refers to “ten thousand talents” (verse 24) and “an hundred pence” (verse 28). “During the first century A.D., it is estimated that 10,000 talents equaled 100,000,000 denarii. One denarius was a typical day’s wage for a common laborer. If that laborer worked three hundred days a year, it would take about 33 years for him to be able to purchase one talent. And it would take over 300,000 years to earn 10,000 talents, the sum of the servant’s debt” (Jay A. Parry and Donald W. Parry, Understanding the Parables of Jesus Christ , 95). By comparison, the 100 pence owed by the fellow servant is about one million times less than the debt owed by the first servant. “[The teacher] noted that the 100-pence forgiveness, which we were all expected to give one another and acknowledged as a pretty fair amount of money, was now preciously little to ask in light of the 10,000-talent forgiveness Christ had extended to us. “That latter debt, our debt, was an astronomical number, [the teacher] reminded us, almost incapable of comprehension. But that, he said, was exactly the Savior’s point in this teaching, an essential part of the parable. Jesus had intended that his hearers sense just a little of the eternal scope and profound gift of his mercy, his forgiveness, his Atonement. … For the first time in my life I remember feeling something of the magnitude of Christ’s sacrifice for me; a gift bordering to this day on incomprehensibility, but a gift that made me for the first time seriously consider my need to forgive other people and to be unfailingly generous regarding their feelings and their needs and their circumstances” (“Students Need Teachers to Guide Them” [Church Educational System satellite broadcast, June 20, 1992], 3). Matthew 18:33. “Shouldest Not Thou Also Have Had Compassion on Thy Fellowservant”? “The great Atonement was the supreme act of forgiveness. The magnitude of that Atonement is beyond our ability to completely understand. I know only that it happened, and that it was for me and for you. The suffering was so great, the agony so intense, that none of us can comprehend it when the Savior offered Himself as a ransom for the sins of all mankind. “May God help us to be a little kinder, showing forth greater forbearance, to be more forgiving, more willing to walk the second mile, to reach down and lift up those who may have sinned but have brought forth the fruits of repentance, to lay aside old grudges and nurture them no more” (“Forgiveness,” Ensign or Liahona, Nov. 2005, 84). “When someone has hurt us or those we care about, that pain can almost be overwhelming. It can feel as if the pain or the injustice is the most important thing in the world and that we have no choice but to seek vengeance. But Christ, the Prince of Peace, teaches us a better way. It can be very difficult to forgive someone the harm they’ve done us, but when we do, we open ourselves up to a better future. No longer does someone else’s wrongdoing control our course. When we forgive others, it frees us to choose how we will live our own lives. Forgiveness means that problems of the past no longer dictate our destinies, and we can focus on the future with God’s love in our hearts” (“Forgiveness Will Change Bitterness to Love,” Ensign or Liahona, May 2003, 12). How have you been blessed through the keys given to Peter, James, and John on the Mount of Transfiguration and later restored to the Prophet Joseph Smith? How could you use the teachings of the Savior in Matthew 18:21–35 to help you forgive others? Write down two or three experiences that have helped you come to know that Jesus is the Messiah, the Son of God. Read “Keys of the Priesthood” in the Guide to the Scriptures (available under “Study Helps” on the Church’s scripture website, scriptures.lds.org). Write about how the events that took place on the Mount of Transfiguration would have helped prepare Peter, James, and John to lead the Church following Jesus Christ’s death. Also, write a paragraph or two about how the Lord has prepared you for important events in your life.